H.M.S. Opal and H.M.S. Narborough were Royal Navy Admiralty M class destroyers. On 12 January 1918, along with light cruiser H.M.S. Boadicea the destroyers went on night patrol to look for German minelayers along the Scottish coast. The weather took a turn for the worse and both destroyers found themselves in serious danger. Visibility was very restricted and both Narborough and Opal were ordered to return to Scapa Flow. 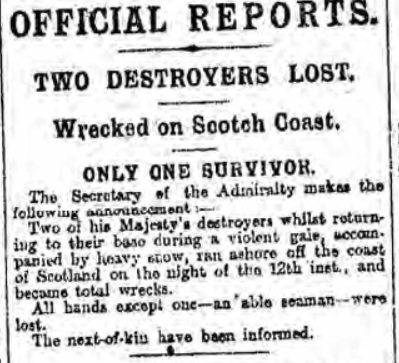 However, despite reporting that they were on course for Scapa Flow, the destroyers never returned. Due to horrific weather conditions it was the next day before vessels could be despatched to search for them. It was two days before Opal was found wrecked on the cliffs at Hesta Rock, just to the north of Windwick Bay, South Ronaldsay. Narborough was found in a similar position nearby. One survivor William Sissons was later located on a small island. He related that the ships had suddenly crashed straight into the rocks, probably due to a navigation error by his captain. 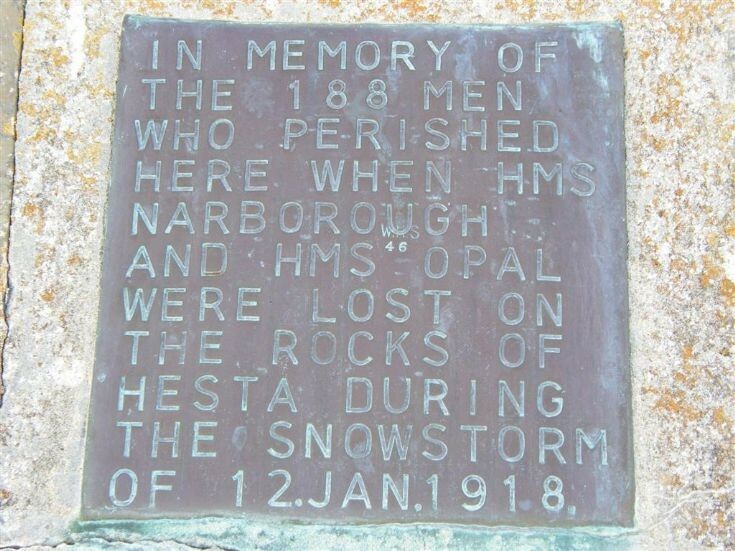 Both wrecks were abandoned and broken up by the sea over the next few weeks taking the bodies of both crews, bar William Sissons, with them – 92 men from HMS Narborough and 96 men from HMS Opal. Able Seaman James Connor, aged 21 from East Hill, Queenstown, Cork. Engine Room Artificer (3rd), Charles Mayes, aged 27, born in Belfast. Surgeon Probationer Louis Percival St. John Story, aged 22, from Ulsterville Avenue, Belfast.